A few years ago something strange happened. Suddenly everybody was playing a scrabble-like game on their phones. Quite a simple app, Wordfeud, made people play the good old word game. It became so massively popular that it became the most downloaded app in Europe. People made friends trough the app, old friends met again playing an oldfashioned game, everybody loved it. And let’s face it: there is no better way of keeping in contact with your friends and relatives then playing a game. Play a word now and then, send a message, keep in contact. The hype has passed. After a while even a classic game like Scrabble gets boring. Next to that, a lot of cheating took place. Al kinds of apps can ‘help’ players to find the highest scoring word. So: it’s time for a change. Kim Winkelaar, Dutch expat in Dubai, still plays WordFeud with his mom and other relatives in the Netherlands. And decided he wanted to change the game to make it challenging again. And so he did. So: SmartFeud was born. Kim’s mission: make the game more fun and challenging, but keep it simple. Compared to Scrabble-like games SmartFeud has got a couple of improvements. The board has been enlarged from 15*15 to 16*16. Screens have gotten bigger over time, there is plenty of space to enlarge the board. On top of that SmartFeud has got a three-player and a four-player option. This makes it a game that can be enjoyed with your complete family. 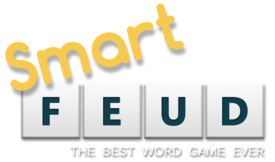 But the most important change is that SmartFeud makes it possible to pick a letter from the board, and use it to form your own new word(s). Say, you play the word ‘WON’. Your opponent can take the ‘W’ of the board, and use it. Of course all the words formed on the board have to be in the dictionary. This small extra feature makes the game a lot more interesting. Not only do you have to think about what words can be formed with the letters you’ve got. You should also find out what’s the best letter to take from the board, and how to use that letter for your own advantage. It takes a lot more of your brains capacity, more puzzling, and it makes it a lot harder to cheat. It makes it so much more challenging, you’ll be hooked in no-time. On top of all these changes SmartFeud comes with a ‘Professional-mode’. When playing as a pro you lose your turn when playing a word that is not in the dictionary. This has been invented because one of the most heard-of complaints about Scrabble-like games is that people keep on trying weird words just to score points. In professional-mode you’ve got only one chance. Some people will love this addition. SmartFeud comes as a free download in the app-store, but Professional-mode is only available in the paid version. The free version is complete, and will be available soon on Android as well as iOS. It comes with in-game advertisements. If you like the game you can buy the paid version for around $5,- and get rid of the advertisements.